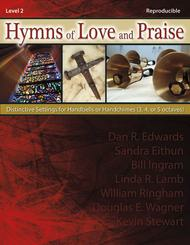 Hymns of Love and Praise (Distinctive Settings for Handbells or Handchimes (3, 4 or 5 octaves)). Composed by Douglas E. Wagner. For handbells (3-5 octaves) / handchimes (3-5 octaves). Handbell collection. Level 2. Collection. Published by Lorenz Publishing Company (LO.20-1517L).Level 2 - Drawing from the collective talents of seven gifted writers, this collection includes eight creative settings of a few of the church's most enduring hymn tunes. The titles focus on the central themes of our love for the Lord and the daily praise and thanks that we offer for the constant stream of blessings that He sends us. The music is easy to prepare, and the reproducible format makes for an unbelievable bargain. Each arrangement is designed for performance on handbells or handchimes, with no shakes or stopped techniques included in any of the selections.